As I posted the other day, Caclulation Manager 11.1.2.3.505 was released. Not only did it include the fixes to the CDF declarations, it also contained some new CDFs we haven’t seen before. Well, Calculation Manager 11.1.2.4.002 was released on Monday (patch number 20830325) and contains the same fixes as 11.1.2.3.505. This version of Calculation Manager contains the new CDFs as well as fixes the issues with the CDF registration. I think it’s great that the Calculation Manager team continues to crank out new CDFs for us to use. Beyond that, I am very impressed that they have caught up the 11.1.2.3.50x Calc Manager to the 11.1.2.4.002 version. It would be very simple for them to say that the new CDFs will only be added to the latest release, but they have kept the 11.1.2.3 version up-to-date. Kudos to Oracle and the Calculation Manager product team! On Tuesday, 6/9, Calculation Manager patch set update 11.1.2.3.505 was released. I have previously written about the errors in the CDF registration and how to fix those. I am very happy to report that all of the CDFs are now registered properly in 11.1.2.3.505. Not only that, but there are some new CDFs to report with this version of Calculation Manager as well. Calculation Manager 11.1.2.3.505 is a patch set update now available on My Oracle Support as patch number 20968612. @CalcMgrPadText (text,length,padText,append) – Fills the text with a padding text before or after the text to make up the length. @CalcMgrMatches(text, regExpr, ignoreCase) – Returns true, if the first substring of this string that matches the given regular expression. For regular expression, please refer to java docs for java.util.regex.Pattern. @CalcMgrFindFirst(text, regExpr, ignoreCase) – Find the first substring of this string that matches the given regular expression. For regular expression, please refer to java docs for java.util.regex.Pattern. @CalcMgrFindLast(text, regExpr, ignoreCase) – Find the last substring of this string that matches the given regular expression. For regular expression, please refer to java docs for java.util.regex.Pattern. @CalcMgrDoubleFromString(text) – Returns a double. @CalcMgrGetCurrentDateTime() – Returns the current date and time in the YYYYMMDDHHMMSS format. @CalcMgrGetCustomDateTime(year,month,day,hour,min,sec) – Returns the custom date and time in the YYYYMMDDHHMMSS format. @CalcMgrGetDateTimePart(date,date_part_ex) – Returns the Year/Month/Week/Day/DayOfYear/Weekday/Hour/Minute/Second as a number from date. Options for the date_part_ex parameter are: Year, Month, DayofMonth, WeekOfYear, WeekOfMonth, DayOfYear, Hour, Minute, or Second. These are Strings passed and the capitalization does not matter. 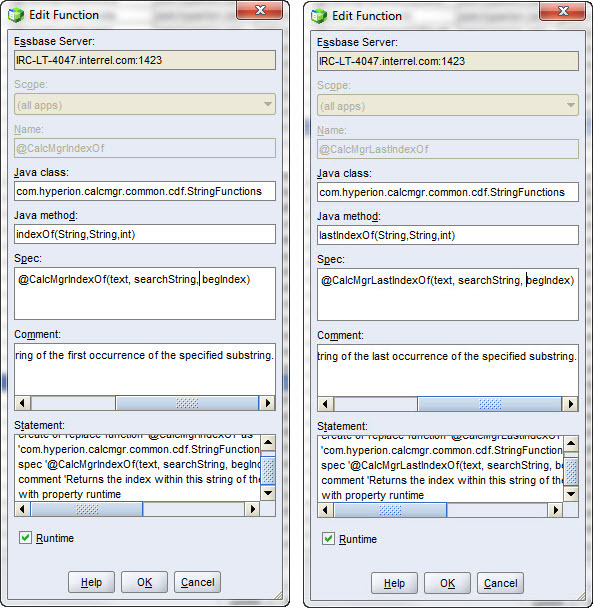 @CalcMgrMesssageFormat(text,parameters) – Creates a String with the given pattern and uses it to format the given arguments. This one is interesting, it accepts the parameters to basically create a dynamic string that can be used in messages. You might pass those messages to a custom log file or even into an email for your administrators. Three blog posts in three days? He’s on fire. Maybe that’s not as highbrow as Cameron Lackpour’s references; however, if you’re in your 30’s, you probably understand. A couple of days ago, I posted the fix to five of the Calc Manager CDFs in 11.1.2.3.502. Well, as luck would have it, a new patch to Calc Manager 11.1.2.3 was released a few days ago on January 15. As one that frequents this blog, I’m sure you all went right out and made those changes to your essfunc.xml files and are wondering if that was necessary or if this release fixes those CDFs for you. I downloaded and applied the patch to my laptop’s sandbox EPM system and found that all 55 of the @CalcMgr* functions from 11.1.2.3.502 persist in 11.1.2.3.503. Not only do the same CDFs persist, but so do all five errors on the CDF declarations. I compared the essfunc.xml files from the two patches and found only a few differences but nothing that would materially change the implementation of the CDFs between 11.1.2.3.502 and 11.1.2.3.503. To sum it all up, if you have fixed your CDFs in 11.1.2.3.502 and are planning to apply 11.1.2.3.503 (patch number 19927906), then prepare to re-fix your CDF specifications in either EAS or the essfunc.xml file again. The great news is that if you have used some of the cool functionality in Calc Manager 11.1.2.3.502, you can still use it in 11.1.2.3.503. 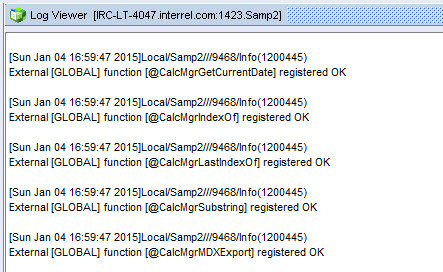 **** EDIT 6/11/2015 **** Calculation Manager 11.1.2.3.505 has been released and fixes the issues with CDF registration. Celvin Kattookaran and Cameron Lackpour have previously blogged about the Calc Manager 11.1.2.3.502 CDFs. Celvin does a great job in both the ODTUG Blog “Tech Tips” article and his blog where he describes the use of some of these functions. As I was researching these functions, I found several errors in my Essbase application logs where five of these functions are not registered properly. So, how do we fix these? Celvin comes to the rescue on the first one. In his Tech Tips article, he explains that we need to remove the “int” input parameter in the Java Method field. In EAS, I right-clicked on my Essbase server and selected Edit>Functions. Inside the CDF Manager, I selected the @CalcMgrGetCurrentDate function and clicked the Edit button. Inside the Edit Function window, we change the Java Method field from getCurrentDate(int) to getCurrentDate(). Stop/Restart an application and view the log to verify that the function is registered properly. That works great and it’s one down, four to go. Next we can fix @CalcMgrIndexOf and @CalcMgrLastIndexOf with the same steps. These functions are not declared properly. I took at peek into the Java class for these functions and found that they need to receive two String variables and a numeric variable. The default specification is one String and one number. To fix these two functions, we need to add an additional String to the input parameters in the Java Method field. Change indexOf(String,int) to indexOf(String,String,int). Next we need to edit the Spec field to add “searchString”. Change @CalcMgrIndexOf(text, beginIndex) to @CalcMgrIndexOf(text, searchString, beginIndex). The Comment field is over 256 characters. Great, now what? Well, we can edit the comment field and remove the third line and that would allow us to save the function back since we would have reduced the comment field to under 256 characters. More on that later… Until then, this is what your function should look like when it’s fixed. The final function is @CalcMgrMDXExport. Celvin has a great explanation of how this works and shows a great example on this blog, so read that to see how cool this is. This function is missing the Class in its Java Class field. To fix this one add “.MDXExport”. We need to change com.hyperion.calcmgr.common.cdf to com.hyperion.calcmgr.common.cdf.MDXExport. That’s pretty simple, but we are again going to run into issues with EAS CDF Manager. As we previously found out, the Comment field has a limit of 256 characters in EAS. If you cut down the comment on this function, you’ll also find out that the Spec field has a limit and of course this function is too large. Through testing, I found the limit of the Spec field is 128 characters. The default Spec for this function is 162 characters. We could use shorthand changing “application” to “app” and “database” to “db”, but that’s really a pain. If only there was a way to edit these functions without losing the comments and extended specification. This is where Cameron’s blog comes in. Cameron has covered the Planning CDF functions in the past and explained that the “essfunc.xml” holds a better explanation of the @Hsp* Planning functions. Well, that’s also the file that EAS looks at when you Open the CDF Manager, only in a different location. So, if you make these same changes to the function specification in the proper essfunc.xml file, the functions will be fixed in EAS and you can then call them like a calculator function. The essfunc.xml that contains the definitions of my server-wide CDFs, that is the functions that are valid for all applications, is stored in C:\Oracle\Middleware\user_projects\epmsystem1\EssbaseServer\essbaseserver1\java. As I have previously blogged, I prefer TextPad for my text editing duties, so that is the tool I used for editing. Just inserting “.MDXExport” in the javaSpec is all we need to do. No messing around with shorting the Comment or Spec fields needed. Save the file back to the server. To verify the change was made, we can view the function in the EAS CDF Manager where we should see our edits have saved properly. Stop and restart your application to verify that the edits were successful and that the function has registered properly. The five specification errors fixed and ready to be used. ****EDIT 6/11/2015 **** Calculation Manager 11.1.2.3.505 fixes these errors, so just apply PSU 20968612 and you won’t need to mess with fixing the CDF registration in EAS or the essfunc.xml.